The colour is black background with snake print effect. Other Stuff. Length fromshoulder approx 40 ". Neckline is boat shape with v neck at back.sleeves cut up. waist approx 30". acetate / polyamide / elastin. Karen Millen dress size 14. Dispatched with Royal Mail 2nd Class. EXQUISITE KAREN MILLEN BLACK SATIN. BOW DETAIL SKIRT SIZE 12. 3D BOW DETAIL ON FRONT OF SKIRT. Beautiful Karen Millen Champagne Halter Neck Top with Swarowski crystals around neckline Size 8. Condition is Used. Dispatched with Royal Mail 1st Class. Karen Millen Limited Edition Stretch Satin Pleat Wiggle Cocktail Dress 14 UK. This is a bodycon dress and has a satin fabric with pleat folded neckline. A sculptural, fitted, knee-length satin dress, with luxurious pleated contrast shoulder detail and a V shaped back. Karen Millen Green And Black Satin Dress Size 8-10 Excellent clean Condition. Factory 2nd as sizing wrong label has been removed slightly Condition is Used. measurements viewable in photos any question please ask Dispatched with Royal Mail 1st Class. Karen millen evening top Size 14. Condition is Used. Dispatched with Royal Mail 1st Class. Karen Millen Black Top Satin Embellished Sleeveless Size 8. Beautiful, authentic Karen Millen embellished top. Really flattering cut with zip up the back of the garment. Sits nicely just above the hips. Looks great with black jeans / leather trousers. Condition is Used. This top has been well loved and worn at many a party, therefore a few of the embellishments have fallen off or come loose, however it is still in great and the lost beads are hardly noticeable when you’re having a good time, see last pics for details. This is a highly sought afterKaren Millen dress in a size UK 6 (EU 34, US 2). It was £170 new so grab a bargain. It's a gorgeous cold shoulder design which looks very elegant on. In white with a lovely multi coloured floral print. Selling a stylish Karen Millen sleeveless top/jaket - Size 12. It has been worn but the condition is good. Please note that Karen Millen clothes feel slightly smaller compared to the stated size. No returns accepted due to the inexpensive price. Karen millen dress. Condition is Used. Dispatched with Royal Mail 1st Class. Signed for delivery. Stunning one shoulder snow tiger dress. Looks simply stunning on. Only worn twice and cost £175 new. Excellent condition. Side zip. Karen Millen Blurred Photgraphic Floral Wiggle Dress. Beautiful floral satin pencil dress from Karen Millen with contrast panel. Ticket Price £160. Colours will very between monitors so actual colour may be slightly different. Karen Millen Dress size 8 good condition knee length satin. Condition is Used. Dispatched with Royal Mail 2nd Class. KAREN MILLEN Black Zip Front Satin Trim. Front pattern detailing - see photos Size UK 10. Good condition. Sold as seen - no returns PLEASE SEE OTHER ITEMS FOR SALE - having a big clear out! This is a stunningKAREN MILLEN dress in a size UK 10 (US 6, EU 38). Made from Karen Millen signature stretch satin fabric which holds you in nicely when on. It's a real head turner and you're guarenteed to have everyone asking where you bought your dress. KAREN MILLEN STRETCH SATIN JADE GREEN DRESS 14. Condition is Used. Gorgeous dress worn once now too small. Small fitting more a 12 in my opinion. Any questions please ask. Karen Millen Floral Mirror Print Wiggle Dress. Stunning mirror floral print wiggle dress from Karen Millen with contrast back. Colours will vary depending on monitor settings so the actual dress colour may be slightly different. Karen Millan ladies skirt in size 8. It is made of 70% acetate, 27% polyamide and 3% elastane, the lining is 95% acetate and 5% elastane. But it does have a satin feel to it. The waist band is 13 inch and the length is 21 inch. It has a zip to the side to help get on and off. This skirt would look great in the office. 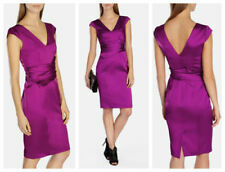 Karen Millen Purple Satin Ruched Pencil Dress - Size 10. Original price £225. Condition is Used. Dispatched with Royal Mail 1st Class. Used Karen Millen dress. Satin silk. Has boning in the upper part of the dress to act as a built in corset so gives a great hourglass shape. Diamanté detailing on the front. Concealed side zip. As you will see from pictures there is a hole in the garment where the zip is. The zip is still in tact and not effected - it is the outer part of the seam that has a hole. Anyone who purchases this dress does so in the full knowledge of the above. I will not accept returns or give refunds when challenged why there is a hole in the dress. Size 12. Designed to be fitted. Karen millen Oscar style Stunning halter neck Ball Gown /Prom Dress Gold Size 14 but KM always comes up a bit small so a 12/14. It's quite spacious around the bust being a halter neck (I am smaller on top than bottom so found it big around the bust after having a baby) As you would expect from KM it is very well made and very flattering. Fully lined. Flares from the knee to give a very elegant shape when worn. Small mark on the bust and some staining around the bottom of the dress. Neither can be seen when worn and only found when looked for but I wanted to be honest. Was dry cleaned the last time it was worn. Stunning Karen Millen pencil wiggle dress. Graphic print in blue and white shades with black illusion panels to sides. Boat neckline. In excellent used condition. UK size 12. Fabric Shell: 71% Acetate, 26% Polyamide, 3% Elastane. Karen Millen black Satin Embroidered Dress with Peplum Hem 8. Beautiful styling with embroidery detail in peach & pink shades. Peplum Hem Flattering ruching on waist. Invisible zip. Plaited straps. Perfect for summer weddings/special occasions. Beautiful condition and Karen Millen quality throughout. Stunning karen millen dress size 8. Excellent condition, only worn once. Good luck 😉. karen millen ladies size 8 satin fitted party dress excellent condition. Condition is Used. Dispatched with Royal Mail 1st Class. Karen millen dress size 14 used. Beautiful colour purple, lovely dress.Condition is Used. Dispatched with Royal Mail 1st Class. 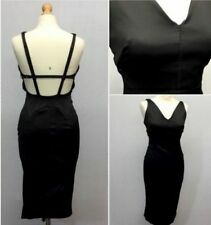 Rare Karen Millen Wiggle Pencil Dress 10 UK. And very high quality as you would expect from Karen Millen. The colour is black background with snake print effect. Neckline is boat shape with v neck at back.sleeves cut up. This is a stunningKAREN MILLEN dress in a size UK 8 (US 4, EU 36). Made from Karen Millen signature stretch satin fabric which holds you in nicely when on. It's a real head turner and you're guarenteed to have everyone asking where you bought your dress. KAREN MILLEN. THis dress can be worn strapless or strappy. Stunning dress not many around, side zip fastening and fully lined. Grab it before it goes! Stunning Karen Millen Cream, Champagne Lined Skirt - Size 12. Worn just once to a wedding. Split up the left leg. This is a highly sought afterKaren Millen dress in a size UK 10 (US 6, EU 38). Like all Karen Millen dresses this has been very cleverly designed with ruching to the waist and flattering sweetheart neckline. This is an amazing rareKAREN MILLEN dress in a size UK 12 (US 8, EU 40). 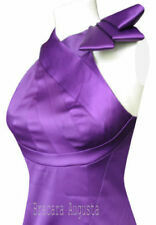 Made from Karen Millens signature stretch satin fabric which holds you in nicely. Would look stunning worn to any special occasion. This is a stunningKaren Millen dress in a size UK 10 (US 6, EU 38). Made from Karen Millen's signature stretch satin fabric which holds you in nicely. It's white with a black floral pattern. Would be perfect for a wedding or the races worn with a black fascinator. £175 KAREN MILLEN PAINTERLY Tiger Lily Watercolour Floral Satin Wiggle Dress 10. Excellent condition, worn once. Dispatched with Royal Mail 2nd Class. This is a highly sought afterKaren Millen dress in a size UK 10 (US 6, EU 38). Made from Karen Millen's signature stretch satin fabric which holds you in nicely when on. In white/ivory with a multi coloured floral pattern. Cotton fabric with satin trim in collar, sleeves and throughout button line. Belt is marked as usual with Karen Millen. All buttons are the original ones. There is a small mark on one of the sleeves (as seen in pictures). karen millen 12 dress Satin, Wedding, Cruise, Racese! 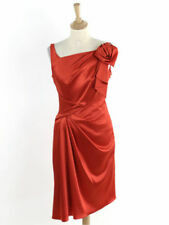 karen millen 12 dress Satin, Wedding, Cruse, Racese! . This dress is beautiful for any special occasion!! There is a slight rip to lining inside (as pictured) but makes no difference to dress at all! any questions please ask!! happy Bidding: ) Condition is Used. Dispatched with Royal Mail 1st Class. As the UK's number one heart charity, the cutting edge research we fund has already made a big difference to people's lives. Marked Size - UK 14. Lightgeneral wear and markings throughout from previous wear. karen millen satin evening long dress Pink Size 12 Dry Cleaned. Smoke/pet free home.Really good condition Dispatched with Royal Mail 1st Class. Beautiful Karen Millen Dress Uk 12 used but in good condition great for outings.